Oxygen Therapy is a simple, non-invasive and painless treatment that has been used to treat the symptoms of MS and promote healing for many years. In this context, our Oxygen Treatment involves breathing pure oxygen in a chamber at 1.5 to 2 times normal atmospheric pressure. When we breathe in air, only 21% is oxygen; the remainder is composed of nitrogen and other gases. 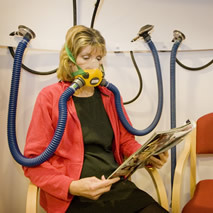 Oxygen Treatment under pressure involves breathing 100% oxygen, delivered through a tight-fitting mask via a demand valve. Oxygen is essential to the tissues in the body. Any tissue injury requires oxygen for healing. The process by which damage to the nervous system is caused in MS cannot be prevented by Oxygen Treatment. However, as the body normally heals itself using oxygen from the air, additional oxygen can extend the body’s ability to heal and can limit some of the damage which the disease causes. Recent research at the University of Dundee (see study findings linked below) has shown that, in the inflammation that is typical of MS, the transport of oxygen is severely limited by fluid leakage from capillaries causing tissue swelling around the attack site. When 100% oxygen is breathed in under pressure, more oxygen is dissolved in the blood than would normally be the case. As a result, swelling around attack sites is reduced, blood vessels constrict, preventing leakage and it also allows tissue which is not dead but ‘sleeping’, to repair itself. Thus the aim of Oxygen Treatment in MS is to minimise the amount of damage being caused, promote rapid healing and limit the scar formation, which can prevent nerve function being restored. The most significant noticeable benefits are in improved balance, sensory perception and control of incontinence. Oxygen Treatment is not a cure for MS, but it does seem effective in helping people with MS to slow down the disease progress. In addition, it often succeeds in obtaining some improvement in general condition. 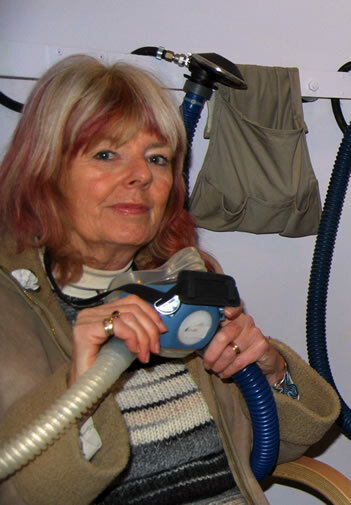 Oxygen Treatment is available at the Therapy Centre, and is offered with the knowledge of the member’s G.P. It is conducted within strict regulations and all operators are comprehensively trained in its use. The initial course consists of 15 sessions, each lasting 1 hour. These are then followed by ‘top up’ sessions that may vary from once a week to once a month. Our chamber at the Therapy Centre accommodates up to 6 people. All sessions are individually monitored, as is the member’s progress. Sessions are paid for by voluntary contribution. 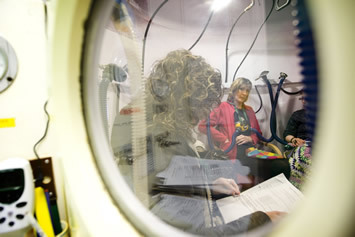 Read about what happens in an oxygen session.